So when do we attack? When I released the Treasure Hunt Radar, it started picking up publicity and sales, and then, Second Life had a major grid crash. When I released the Lucky Chair Detector plugin, it just started taking off and then, another grid crash happened, though a smaller one. Now there’s Designer Showcase Network. And three days into it’s operation, the server just keels over with no explanation or anything, causing the momentum it accumulated to severely decrease. I think this universe has something against me. Well, the universe will be very sorry later! It all started with boots. First, I saw a notice in FabFree about two pairs of boots being available as group gifts from two different designers. Good overknee boots are actually a major rarity, so I thought nothing about grabbing both freebies, as well as buying several more pairs in my favourite colors. Then I took a closer look at them. Then an even closer one. All of them used an identical sculpt map, and a largely identical surface texture. Mind you, these are very good sculpt maps, and very good textures… well, the base shadowmap that comes with them is. Apparently, everyone else thought so too, because very soon, I noticed a very familiar sight in a report about boots released by Thalia’s. At a lower price than they were previously too. I laughed. 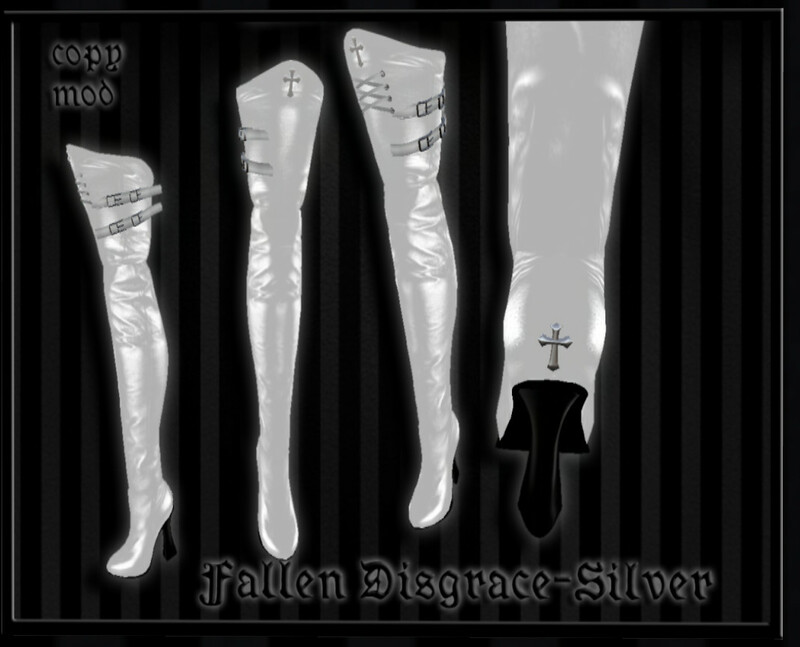 And went to check out Nightshade Designs on a report of another outfit I wanted to consider getting, and there they were, waiting for me and glittering the added crosses and laces. Slightly altered. Still highly recognisable. Well, that’s magnitudes better than just selling them raw, but that’s not worth L$600 if you ask me. Today, I glanced at the XStreetSL and noticed them staring at me from the two newest entries on the front page. From KaShoez and Safii. Further search revealed more – of – the – same for as far down as I cared to scroll. Wait until everyone forgets the releases of your competitors. Trust me, it doesn’t take that long! More than a week, though. Be more earnest like Nightshade and Safii and actually use the boots as a base to build something upon instead of packaging them and hoping for quick profits. Instead of just selling the boots as is, use them to enhance an outfit, since they’re so widely available that you’ve got to be insane if you think the market won’t get oversaturated in a few more weeks. Failing either of the above, give some credit to the original author. I hope they’re much richer for all this charade. Still, at L$3000 per pack, I sort of doubt this. Above all, don’t consider your customers too stupid to notice. Something occurred to me recently, and it was so startling, I have to write about it. It might have an interesting scientific conclusion to it or it might not, but that’s beside the point. It’s a personal blog post more than anything else. I just noticed that a table is the most useless piece of furniture in Second Life. A chair animates you. It has some purpose to it, it’s part of a system of expression that you get to transmit symbolic information. A bed is even more so. A dresser is actually useful to keep backups of your stuff, that’s what I use mine for. But a table serves no purpose. You can put things on it but they don’t really need it. You can pull the table out from under them and they still stay up. It’s purely decorative. It doesn’t need legs, even, because it hangs in the air too. We don’t need bathrooms or toilets, but we still have them. And we very definitely do not need food. But there’s no end to prop food in my inventory. The term “Second Life” sounds so much like “Afterlife” for a reason. It is common knowledge that the Pharaohs took furniture and utensils with them because they believed they needed them. But I suspect this might need some rethinking. We really are ghosts. We don’t need food, or furniture, we could just as well sit on the thin air. We can’t really hug each other, because there is no hope to compute the physics of a complex polygonal mesh, the servers aren’t even strong enough for a ragdoll model. It is our afterlife, a world with no body, or space, a world where time is distorted and fluid because of the network lag, where we can be anything, as long as that ‘anything’ is what others agree us to be. There is literally nothing in this world except people, and we bring with us the ideas of a table, a spoon, a cup of ‘hot’ tea, because they allow us to think of the abstract prims, which are nothing but numbers, in terms of a familiar daily life. We bring the abstract prims meaning that we inherited from generations prior, in a different world. Can we truly be sure that the Egyptians did not send their dead to colonize a lifeless world such as this, where everything is merely some abstract ‘substance’, weightless and invisible ectoplasm? Could it be that they didn’t give them things because they thought these things would be needed, but because they could not otherwise cope with thinking of a world of abstract virtuality where there is, literally, nothing except people? Is Second Life, in truth, nothing but a monstrously big tomb? It is depressing, to a degree, though I’m not sure it’s actually a bad thing if it’s true. The idea that I’m actually dead and was stubbornly refusing to believe it for ten years is not something new for me. It’s supposed to be Christmas, a time of happiness and merriment, and everybody sends each other gifts and greeting cards. It is supposed to be my birthday, but, I have nobody to invite over for it, and no time to be happy, because I’m forced to do mildly impossible, disgusting things of bureaucratic nature, to avoid worse consequences, working literally against the clock, to keep something I know has no future anyway. Because I have had no future for years. This is my way to be invincible, it’s a very static position in a first life that I cannot break out of. It’s far more comfy than that of many other people, but it has no future to it, no growth, no chance of improvement unless something external happens to give me a chance. And there’s nothing that can do it but a person. This position has such a supply of stability that all attempts have, so far, failed, but it’s stable because there’s no way down from here. Eventually, as soon as I get a lucky break, something happens to make me unable to take advantage of it, or just takes it away from me, or… or simply the person betrays me for some other interest, that’s probably the most common. It’s a very personal kind of hell. Go and live tomorrow like this is the last day of your life. First or second one, it doesn’t matter. Be nice to someone. Help someone. Save someone. Give your warmth to someone. And if there’s still anything left after you gave it all to a special someone, find someone else who needs it, too. Be a faithful lover. Be a good friend. Create something and spread it around. Share your knowledge and share your connections. Find someone’s problem and solve it. If you can’t do it, help find someone who can. Bring people together, there is nothing at all in the entire universe except people. That’s the only kind of compassion there truly is. That’s the only way you are alive. Find someone else’s cross and maybe together we can make a raft out of all this bloody wood. Failing that, we could all wear nice uniforms and go lynch Hallmark. That, at least, will get some of us dates. People who spread myths about Copybot blot out the google. I’ve heard a lot of nonsense about it. Some people say it’s a script, so making your land noscript should stop it from working. Others say that IMing it with “!quit” will make it quit, or that reconstructing items copied with Copybot requires a script, which causes LL to ban the user upon compilation. Yet someone else banned a girl from their sim just because she looked at every vendor, thinking that she was copybotting the contents. You cannot stop people from taking your textures, ever, period. Don’t even try, it doesn’t work and it annoys the pig. Textures are cached on the hard drive of everyone who ever sees them. They already have them. That includes the baked texture of your clothing as you wear it when someone else sees you. To recover these textures from cache needs just a page of code, very simple. The format the cache is stored in, uncharacteristically for LL, is well documented, and the code required to recover all textures from it in JPEG2000 format is about a page long. The binaries that come with OpenJPEG project can quickly unpack those J2C files into TGA, which is well supported by more or less anything under the sun. That includes sculptmaps. No, blanking out the alpha channel doesn’t stop this approach at all. Shape slider data are cached, as well as all other slider data. To recover them, one needs the Slice utility, some brains to get it to compile, and some more brains to understand how to translate the stored data back into slider positions, which is fully described in the XML files that come with SL viewer. If your object has modify permissions, the size-type-position parameters of every prim in it can be recovered by a script that will need to be dropped inside. Making your land noscript will not stop anyone from buying a single copy and then creating duplicates in the comfort of their own home, but it will cause your customers undue inconvenience. But a script cannot see which prim is textured with which texture, even though it can grab the texture repeat parameters, and fully automatic duplication or a non-fullperm object with a script is impossible. That includes which sculpt map every prim uses. Any object, any object at all, once someone can rez it or see it when it is rezzed, can be duplicated completely and automatically through the use of a special client, that is, a bot. “Copybot” is just the most famous one, since the source was released, numerous forks exist. It’s not hard to get, though the source code is a bit less widespread. With enough effort, it can be recreated anew. You cannot stop anyone from using such a client by doing anything to your land, because they can buy a single copy of your object and do it in private. Nothing, ever, can copy something it cannot get from the server as part of the data needed to display the world. No things that are in people’s inventories and not attached to their avatars, or inventories of other people’s objects that are not rezzed at the moment it’s copied can ever be gotten at, unless someone discovers a new bug in SL server itself — which, while not unheard of, is not something you should worry about more than the ceiling falling on you. Enough people try every day to make it sufficiently unlikely. Scripts only exist and are executed serverside. They are not needed to display the world, so no bot, or viewer, or anything, ever gets them. In short, copy protection doesn’t work and wastes your resources and annoys your customers. If people spent more time actually creating things and less time worrying about how someone else is copying them or stealing their ideas, Second Life would be a considerably better place. I was just hoping to actually get some real caching going on.